One of the rules is, that he has to make direct eye contact. Yet he's able to geass about twenty people at the same time in Episode 1 from Season 2. He even is able to do it later, too. So how can he do this? Lelouch's Geass manifests itself as "the power of absolute obedience," which allows him to plant commands within a person's mind upon direct eye contact. while yes it does say it works upon direct eye contact it doesn't necessary say that both parties need to make direct eye contact. So how focused is Superman's heat vision? Not very, under most circumstances. Most often, it's depicted as a rapidly widening cone, starting at eye-width but growing to several feet across by the time it reaches the opponent, even at close range. 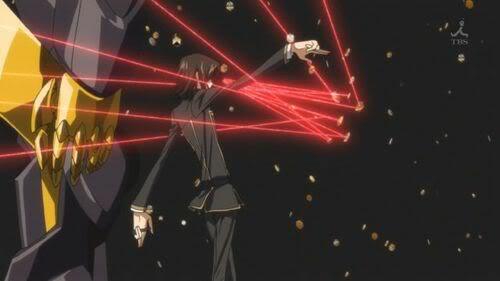 My evidence showing Lelouch alone just need to be able to see his target's eyes is in Season 2: Turn 15 - C's World when Lelouch goes to order Charles to kill himself by having the Shinkirō release mirrors and using one mirror bounce his Geass around to target Charles without Charles being able to target him which his Geass too needed eye contact. this would also explain why the United Federation of Nations' counter measure to his Geass was to trap him in an isolated room and display him on a monitor.